Dental fillings are another service that we offer at Royal Oak Family Dentistry for both children and adults. Most fillings consist of a few steps including removing the decay that has caused the cavity, prepping the tooth (or creating a clean and shapely working service to place the filling material), placing and packing the filling material, light curing the material (causes the material to go from a soft doughy consistency to a hard material), and checking and adjusting the bite. All of these steps can take anywhere from a half hour to a full hour from start to finish depending on the location of the cavity and number of surfaces of the tooth containing decay. Most fillings do require the patient to be numb, but it will wear off within a few hours. It is important to note that if the patient is experiencing sensitivity, especially after a tooth colored filling that it should be checked out by your dentist. Most likely it is a simple fix by just checking the bite. But, without adjustment the sensitivity will not work itself out. 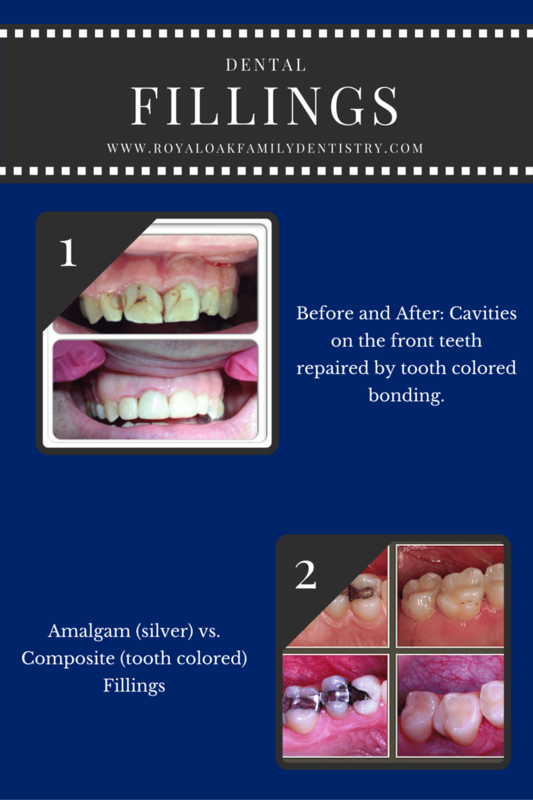 Check out our photo gallery to see how tooth colored fillings look vs. amalgam or silver colored fillings.